Aspen  is a ski resort in the state of Colorado in the Rocky Mountains region of the United States of America. Its little sister is Snowmass Village, which is about 10 miles from downtown Aspen. For those prone to altitude sickness, it is recommended that you fly into Denver and spend a day or so getting used to being at a higher altitude (over 5,000 feet above sea level) and then driving the next 3,500 or so feet up. Aspen-Pitkin County Airport (also known as Sardy Field) (IATA: ASE) (ICAO: KASE)), . Major carriers to Aspen include United Express and American Airlines. ASE is a small airport for small planes only, and traffic tends to stop in any inclement weather. Flying into Denver International Airport and driving up to Aspen is more reliable and often cheaper. Another option is chartering a flight to one of Aspen's nearby private and general aviation airports. Air taxi and air charter companies such as Monarch Air Group  and Mercury Jets  fly a variety of private charter aircraft and jets, from charter luxury Gulfstreams down to economical piston twins for small groups and individuals. Private charter operators including Mountain Aviation  and jet charter brokers such as Private Jets Colorado  provide access to thousands of private planes based in Colorado and around the world for domestic and international flights to Aspen. Charter brokers can also arrange private flights into additional airports in the Aspen area, including Glenwood Springs Municipal Airport (IATA: GWS) (ICAO: KGWS) in Glenwood Springs, CO; Lake County Airport (IATA: LXV) (ICAO: KLXV) in Leadville, CO; and Eagle County Regional Airport (ICAO: KEGE) (IATA: EGE) in Eagle, CO. Private helicopter charters are also available at each airport for fast, easy transfers from jet to helicopter. Helipad facilities in the area include Aspen Gliderport (CO03), Gypsum Creek Ranch Airport (CO47), Beaver Creek Heliport (4CO9), and Pfister Ranch Heliport (78CO). The drive to Aspen is about four hours from Denver. There are two major routes from Denver - through Glenwood Springs or through Independence Pass. Independence Pass is only open in the summer months, but provides spectacular views and can be a bit faster than the longer route through Glenwood. To take this route, travel south from Copper Mountain exit off I70 through Leadville. For the Glenwood Springs route, take I-70 all the way to Glenwood Springs and then head south on Colorado State Highway 82. Scheduled and chartered services are available from Denver International Airport and Eagle County Regional Airport. Most major car-rental firms are located in Denver and Aspen airports. Free buses operate within the cities of Aspen and Snowmass Village, and many hotels have free shuttle service to and from the airport. It's also easy to get around on skis in the winter and mountain bikes or your own two feet in the summer. John Denver Sanctuary - this Aspen park is a pleasant place to take your dogs or kids for a splash in the creek in summertime. The park is named after the famous country and folk singer who resided in Aspen. Lyrics from his most popular songs are inscribed in the creekside boulders. John Denver Sanctuary is on the creek trail on the north side of Aspen, near the Rio Grande Park at N. Mill St. and Rio Grande Pl. Maroon Bells - a short drive outside of Aspen, the Maroon Bells are one of the most photographed mountain scenes in Colorado. The views of the small lakes and the 14,000 foot peaks are spectacular. 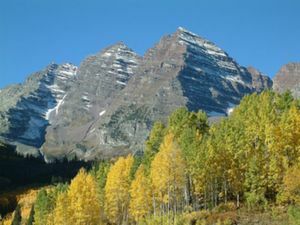 There are some short, non-strenuous hikes around the Maroon Bells that vary from 1 mile to 10. People also like to climb the Maroon Bells; however, it is very dangerous, and a guide is highly recommended. In the summer months (mid-June to the first weekend in October) between 8 a.m. and 5 p.m., visitors must take a shuttle bus to the Maroon Bells to control traffic. Tickets are $6 for adults and $4 for children. Board the bus at the Aspen Highlands Village. Parking at the village is $5 per vehicle. Another option is to take the free shuttle from the Rubey Park Transit Center to the village. In non-summer months, you may drive yourself. The entry fee is $10 per vehicle. The area is run by the U.S. Forest Service, and they accept national parks passes. Campgrounds are also available. Independence Pass - In the summer months, this pass is open to vehicular traffic. The drive south of Aspen takes you up to the Continental Divide and along the way, passes some of the most beautiful scenery in the area and a ghost town that is open to visitors. Ski - four ski mountains in the area: Aspen Mountain, Snowmass, Aspen Highlands, and Buttermilk. Aspen Golf Club Phone: (970) 925-2145, . Opened in 1980, the 18-hole Aspen course at the Aspen Golf Club facility features 7,165 yards of golf from the longest tees for a par of 71 . The course rating is 72.1 and it has a slope rating of 124 on Blue grass. Maroon Creek Club Phone: (970) 920-4080 . The 18-hole course at the Maroon Creek Club features 7,100 yards of golf from the longest tees for a par of 70 . The course rating is 73.6 and it has a slope rating of 140 on Blue grass. The course opened in 1995. River Valley Ranch Golf Club, Phone: +1 970 963-3625, . Eighteen holes, slope 73.2, rating 125, 7,348 yards. 30 minutes downvalley in Carbondale,River Valley Ranch Golf Club. Good bang for buck. Downtown Aspen has a plethora of shops for every budget. The downtown area also has two pedestrian-only streets lined with t-shirt and souvenir shops. Of course, Aspen is a great place to buy ski equipment and clothing with an abundance of ski shops and stores. The city also has an open air market in the summer months. Carl's Pharmacy in Aspen (306 E Main St) sells not only your typical drugstore goods, but their second floor has souvenirs, toys, and more. City Market in Aspen (711 E Cooper) is a good place to pick up groceries to stock up your cabin. Snowmass Village also has its own shopping precinct, fitted with numerous candy shops, souvenir shops, and ski shops. There are many places in Aspen Snowmass where you can rent all types of equipment including skis and snowboards in the winter and bikes in the summer. At some places, you can also book your ski or snowboard rentals online which may save money and time. The Artisan Restaurant in Snowmass in the Stone Bridge Inn has a fresh menu  and many off-menu options. Have lunch at Woody Creek Tavern, in "downtown" Woody Creek. This is the former haunt of the late great Hunter S. Thompson. It's about 15 miles from Aspen. The Pine Creek Cookhouse, 20 minutes south of Aspen on Castle Creek Road, . It is worth the trip down a beautiful valley to the elegant log cabinesque building. Their food is very fresh, on the gourmet side, and not overly expensive. Reservations recommended. Highly recommended to stop in for lunch after a morning hike to one of the many great trails in the area such as Cathedral Lake. The Hickory House, located on the bend towards the entrance to Aspen on Main Street Tourists are often crowded out by the locals, drawn by fabulous barbecue and huge, hearty breakfasts. If you're lucky enough to be in Aspen for Thanksgiving, turn out for annual Hickory House freebie: turkey, with all the trimmings, and all gratis. Syzygy 520 E Hyman Ave,(970) 925-3700‎. A trendy, favorite for many visitors. Aspen Meadows Resort 845 Meadows Road, 970.925.4240 . In Aspen's West End and home to the Aspen Institute. The Music Tent is on the hotel's immense 42 acres. Features tennis courts and a health club with great views and recently refurbished guest rooms. Silvertree Hotel, Phone: +1 970 923-3520, . Downtown Snowmass Village hotel and conference center. Self-contained and central in Snowmass. St. Regis, Phone (970) 920-3300, . Outstanding luxury hotel in the heart of Aspen from which you can directly debark Ajax lifts. Sky Hotel, 709 East Durant Avenue, Phone: +1 970 925-6760, . The Gant, 610 West End, Toll free: +1 800 549-0530, . An upscale condominium resort, The Gant offers 2-4 bedroom condominium rentals with a variety of resort features and a convenient location near downtown Aspen. Carbondale - About 40 minutes down the valley north of Aspen, Carbondale is a nice, eclectic mix of artsy, outdoorsy and earthy/hippie. It has art galleries with offerings much more affordable than you will find in Aspen, plus an astonishing range of restaurants from Chinese, Salvadoran, Mexican, Italian, Thai and Asian/Fusion. Restaurant 689, located at 689 Main Street, rivals Aspen's best offerings. During mid-summer, Carbondale's Mountain Fair is a free three-day music extravaganza and art fair. Artisans come from all over the U.S. to exhibit and sell hand-made clothing, jewelry, toys, paintings, sculpture and home decor. The home town police, who are very low-key and friendly, wear tie-dye for this event. Colorado's Wine Country is home to over 70 wineries and its own indigenous vineyards. Wine lovers can enjoy several scenic day trips from Vail to many of the small towns that grow their own grapes. These lovely little communities include Montrose, Palisade, Paonia, and Hotchkiss, as well as the city of Grand Junction. Denver - A four hour drive away, Denver is Colorado's capital and largest city. Denver boasts historic buildings and modernistic skyscrapers, abundant shopping and incredible dining. Located where the Great Plains meet the Rocky Mountains, Denver has some of the best views a city can have. It is also home to one of the last downtown amusement parks, Elitch Gardens. Glenwood Springs - Home to a quaint, historic downtown and the largest hot spring pool in the USA. This page was last edited on 17 March 2019, at 16:25.